Generating nitrogen can substantially reduce the cost of nitrogen consumption, and is the primary reason for the purchase of most GN2 systems. The price of purchasing nitrogen in a gaseous or liquid form can vary from $2.88 to $0.60 per 100 ft. The price range can be a result of volume consumption, type of product, location, or vendor. A GN2 system will produce gaseous nitrogen at costs that ranges from $0.320 to $0.131 per 100 cubic feet. The price range is a result of local power costs, compressor efficiencies, compressor and generator maintenance costs, and required nitrogen purity. An average GN2 system has an (ROI) return on investment of 6 to 18 months. This rapid return enhances the financially attractive position of a GN2 system above and beyond the 75% to 92% base reduction in nitrogen cost. The earth’s atmosphere is comprised of approximately 78% nitrogen and 21% oxygen. Once atmospheric air is compressed, its pressure is increased while proportions of nitrogen and oxygen remain unchanged. The compressed air is filtered and dried then introduced to the GN2 nitrogen generator. 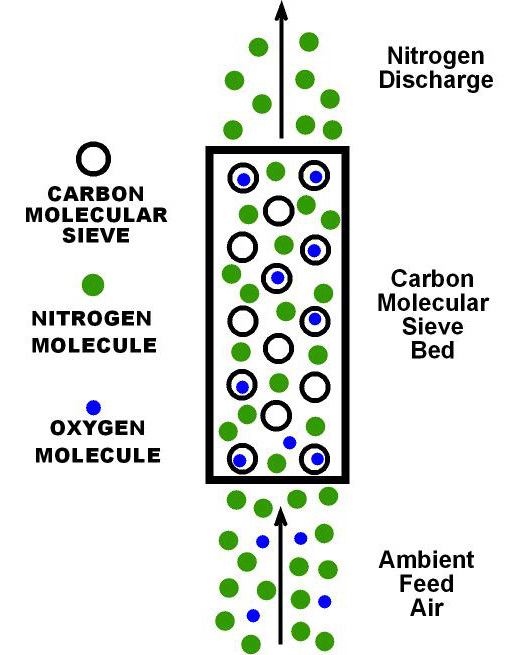 As the air flows through a bed of CMS (Carbon Molecular Sieve) oxygen molecules are selectively adsorbed into the CMS allowing the larger Nitrogen molecules to pass. With the oxygen molecules trapped in the CMS bed a high purity stream of nitrogen is discharged from the GN2 nitrogen generator. When one bed has reached it’s adsorption capacity the towers invert and a regenerated bed continues adsorbing oxygen while the other tower begins a regeneration process. This cyclic action continues allowing the GN2 to produce a steady stream of high purity nitrogen gas. This process is commonly known as Pressure Swing Adsorption (PSA). Contact our sales department at (888) 491-4011 or email us at info@ciscoair.com for more information. To download one or more brochures about the information described on this page please click on the download button below. 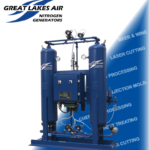 Please fill out the form below to download the Nitrogen Generators brochure.